When it’s really hot outside it usually doesn’t only affect me physically but also it usually reduces my hunger feeling. 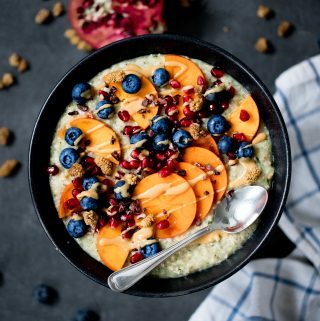 Very often I don’t really feel like eating lunch, especially nothing warm so I usually go for smoothiebowls or summer salads. Something light and easy to digest. This Asian-inspired summer salad is one of my new favorites! I don’t know if I am the only one who feels that way – but for me the shape of a vegetable has an effect on its taste. What do I mean with that? Let me give you an example. A shredded carrot to me tastes different than a spirilized carrot or carrot chunks. Especially in salads I like to use this – different textures and consistencies make a salad more exciting and less ‘boring’. 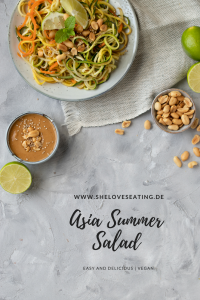 Also using different ingredients and dressings will make a big difference – in this case I made the dressing with soy sauce to create this Asian taste of the summer salad. 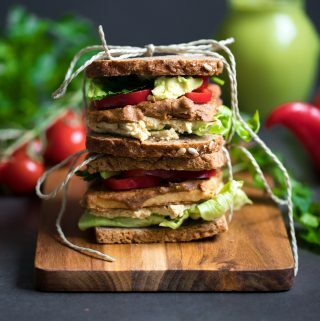 The word salad decribes only a certain category – not a specific type of meal. However, when mentioning salad people often think of leafy greens although there are many different types of salads. Of course there are the green salads like arugula, Romain lettuce, lambs lettuce, etc. which are often used in green and mixed salads. 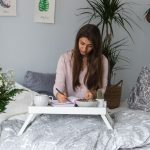 But the category salad also includes delicious meals like bean salads, chickpea salads, couscous salad, lentil salad, pasta salad, potato salad and so much more – the options are endless. 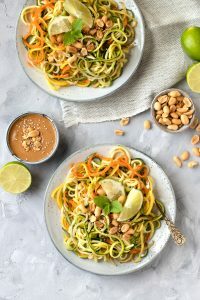 The base of this summer salad are spiralized zucchini – inspired of Thai salads which usually come with mango, papaya and zucchini (courgette). Other than that you only need a few ingredients and the salad makes a perfect side dish or first course. 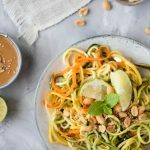 I like to use a spiralizer which you can order only in small or big formats. I got mine from Amazon and I love it! 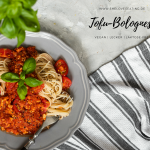 If you would like to try something different than this summer salad you should give my baked tofu a try – super crispy and delicious! 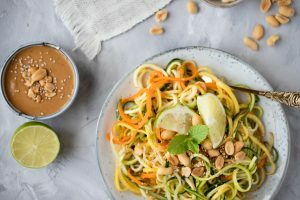 Rinse zucchini and carrots and spiralize them. If you don't have a spiralizer you can cut them into fine stripes instead and put everything in a bowl. 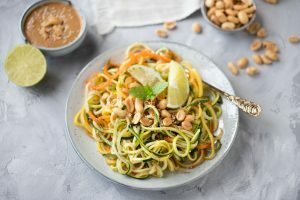 Cut the peanuts into chunks and add together with sesame seeds and dressing to the spiralized veggies. Give it a stir. If you like you can add a little sesame oil for the final touch.